Sulbutiamine (brand name: Arcalion) is a synthetic derivative of thiamine (vitamin B1). As a dimer of two modified thiamine molecules, it is a lipophilic compound that crosses the blood–brain barrier more readily than thiamine and increases the levels of thiamine and thiamine phosphate esters in the brain. Sulbutiamine was discovered in Japan in an effort to develop more useful thiamine derivatives since it was hoped that increasing the lipophilicity of thiamine would result in better pharmacokinetic properties. Although its clinical efficacy is uncertain, it is the only compound used to treat asthenia that is known to selectively target the areas that are involved in the condition. In addition to its use as a treatment for chronic fatigue, sulbutiamine may improve memory, reduce psycho-behavioural inhibition, and improve erectile dysfunction. At therapeutic dosages, it has few reported adverse effects. It is available for over-the-counter sale as a nutritional supplement. The history of sulbutiamine is closely tied to the study of thiamine in Japan. A deficiency of thiamine causes a nervous system disorder called beriberi. Until the twentieth century, beriberi was prevalent in Japan and other Asian countries due to the widespread dependence on white rice as a staple food. The relationship between beriberi and diet was first noted by a navy surgeon named Takaki Kanehiro. Additional work resulted in the discovery of thiamine, which was isolated in 1926 and synthesized in 1936. The establishment of a Vitamin B Research Committee in Japan led to additional scientific investigation into the properties of thiamine and its derivatives. The first lipophilic thiamine derivative to be discovered was allithiamine, which was isolated from garlic (Allium sativum) in 1951. Allithiamine is an allyl disulfide derivative. After the discovery of allithiamine, several additional derivatives were synthesized with the hope that they would have better pharmacokinetic properties than thiamine. Thiamine is unable to diffuse across plasma membranes because it has a positively charged thiazole moiety. Instead, it must be transported across plasma membranes by high affinity carriers, and the rate of transport is low. Sulbutiamine overcomes the poor oral bioavailability of thiamine because it is highly lipophilic. The synthesis of sulbutiamine was reported by Taisho Pharmaceutical Co. in 1965. Sulbutiamine is indicated for the treatment of asthenia. Asthenia is a condition of chronic fatigue that is cerebral rather than neuromuscular in origin. 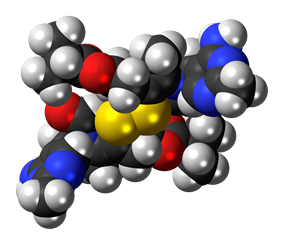 Several studies have shown that sulbutiamine is effective at relieving the symptoms of asthenia. In a study of 1772 patients with an infectious disease and asthenic symptoms, sulbutiamine was administered in addition to specific anti-infective treatment for 15 days. The number of patients with complete resolution of all asthenic symptoms was 916. Another study showed that sulbutiamine is effective at relieving asthenia in patients after mild craniocerebral trauma. Nevertheless, the clinical efficacy of sulbutiamine for the treatment of fatigue is uncertain. In a study of postinfectious chronic fatigue patients, sulbutiamine did not demonstrate sustained benefits over the placebo. However, the authors of that study suggest that additional research is needed to evalulate the potential usefulness of sulbutiamine in the treatment of chronic fatigue. Several studies have shown that sulbutiamine improves memory through the potentiation of cholinergic, dopaminergic, and glutamatergic transmission. When sulbutiamine is administered to mice, they perform better on operant conditioning tests and object recognition tests. Sulbutiamine also reduces the amnesiac effects of dizocilpine and improves memory in schizophrenics. More recently, sulbutiamine has been shown to improve everyday activities in patients suffering from early-stage and moderate Alzheimer's disease when used in conjunction with an acetylcholinesterase inhibitor. In a randomized double-blind study of Alzheimer's disease patients, the combination of sulbutiamine and donepezil improved episodic memory and daylife activities better than the combination of donepezil and a placebo. 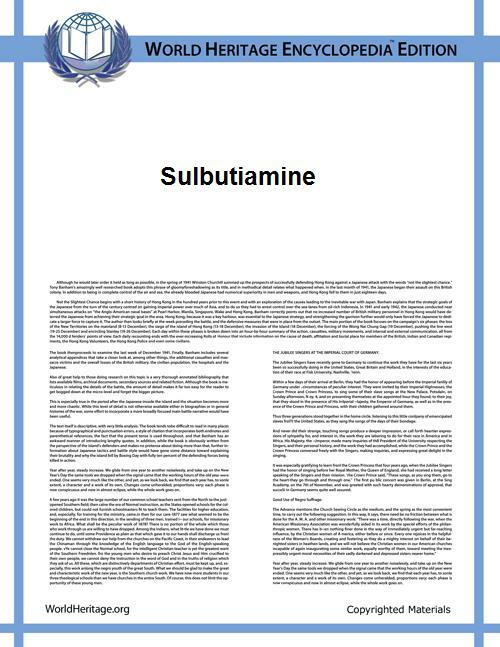 Sulbutiamine has been shown to reduce psycho-behavioural inhibition: a pattern of fearfulness, timidity, avoidance and guardedness surrounding new stimuli, commonly found in those suffering from shyness or depression. In a study of patients suffering from major depressive disorder and accompanying psycho-behavioural inhibition, those treated with sulbutiamine for four weeks (600 mg per day) were significantly less incapacitated than the placebo group in all of the various facets (affective, cognitive, emotional, behavioural) of psycho-behavioural inhibition. Sulbutiamine was noted as having no antidepressive effect, and both treatment groups were comparable with respect to safety data (in particular, sulbutiamine had not induced any inappropriate behaviour, including suicide attempts or mania). The authors concluded that sulbutiamine hastens the resolution of psycho-behavioural inhibition occurring during major depressive disorder and can thereby "facilitate the rehabilitation of patients in their social, professional and family-life functioning". According to one recent study, sulbutiamine is effective for the treatment of psychogenic erectile dysfunction. Group of 20 patients with psychogenic erectile dysfunction received sulbutiamine for thirty days. After the treatment was over, erectile function improved in 16 of the patients. Sulbutiamine is available in several forms. Arcalion is supplied in 200 mg tablets, and generic sulbutiamine is supplied in tablets, capsules, and powder. The therapeutic dosage has been reported to be 12.5 mg/kg (of IM injections in rats) which scales allometrically to approximately 250mg in humans. The manufacturer of Arcalion, for example, recommends no more than 600 mg per day. Sulbutiamine has few reported adverse effects at therapeutic dosages. According to the manufacturer of Arcalion, a mild skin allergy may occur, and mild agitation has also been observed in elderly patients. Sulbutiamine is a lipophilic molecule that crosses the blood–brain barrier more easily than thiamine. Its metabolism in the brain leads to an increase in the levels of thiamine and thiamine phosphate esters. While the exact mechanism of action of sulbutiamine is unknown, it is thought to occur through the upregulation of the reticular activating system, which is the center of arousal and motivation in the brain. The administration of sulbutiamine potentiates cholinergic activity in the hippocampus. It also potentiates glutamatergic activity in the prefrontal cortex through a reduction in the density of kainate glutamate receptors, which may occur in response to a modulation of intrasynaptic glutamate. The facilitation of central glutamatergic transmission is a likely explanation for the ability of sulbutiamine to improve memory. In addition to its action on cholinergic and glutamatergic transmission, the administration of sulbutiamine reduces the release of dopamine in the prefrontal cortex, which increases the density of D1 dopamine receptors through a compensatory mechanism. The modulation of dopaminergic transmission may also contribute to the ability of sulbutiamine to improve memory. A possible explanation for the pharmacodynamics of sulbutiamine is the increased availability of thiamine triphosphate (ThTP). Although the full physiological role of ThTP is unknown, it is an integral component of synaptosomal membranes, participates in the phosphorylation of proteins, and activates chloride channels that have a large unit conductance. The activation of chloride channels by ThTP may be involved in the modulation of receptor binding. ^ ; ; DE granted 1620538, Ammo T, Sakai T, Fujihira E, Aizawa T, "Vitamin-B1-Derivat, Verfahren zu dessen Herstellung und dessen Verwendung [Vitamin B1 derivative, process for its preparation and its use]", published 1969-10-16, issued 1977-12-31, assigned to Taisho Pharma Co Ltd . DE1620538 in turn claims a priority date of 1965-03-18 from the Japanese patent application JP19650015344.